December is a hectic time in our house. Not only do we have the Christmas craziness to contend with, but we also welcome Sinterklaas, and celebrate our son's birthday. I grew up with a January birthday, and received a few more "this is your Christmas/birthday" gifts that I would have preferred, so we try to keep each event separate. Throw in another gift-giving occasion and it's easy to see how a certain little boy can have a hard time protecting himself from a bad case of the gimmees. This past December, D was newly four, and old enough to understand delayed gratification, responsibility, rewards and consequences. In addition to introducing the December List (which I need to write about in a future post) for him to write down the items he'd like and learning how much they cost, we also started using reward and consequence jars. The basic idea we want to impart is that he always has a choice. He can make a right choice or a wrong choice. That is up to him. When he makes a right choice, there may be a reward. And when he makes a wrong choice, there may be a consequence (we didn't want to use the word punishment or discipline). 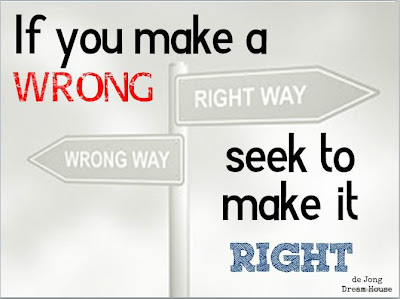 Most importantly, if he make a wrong choice, he can still choose to seek to make it right. 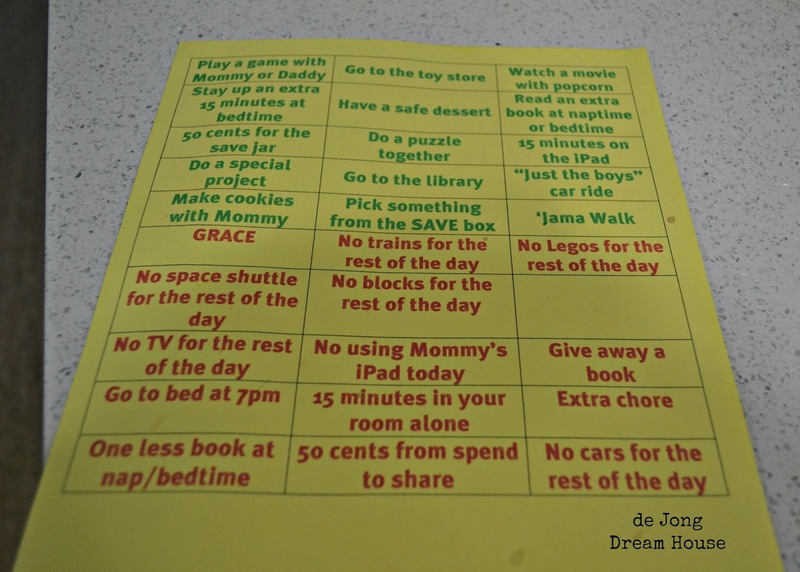 (We made the above printable for his room to help him remember). This was a super easy project to do. 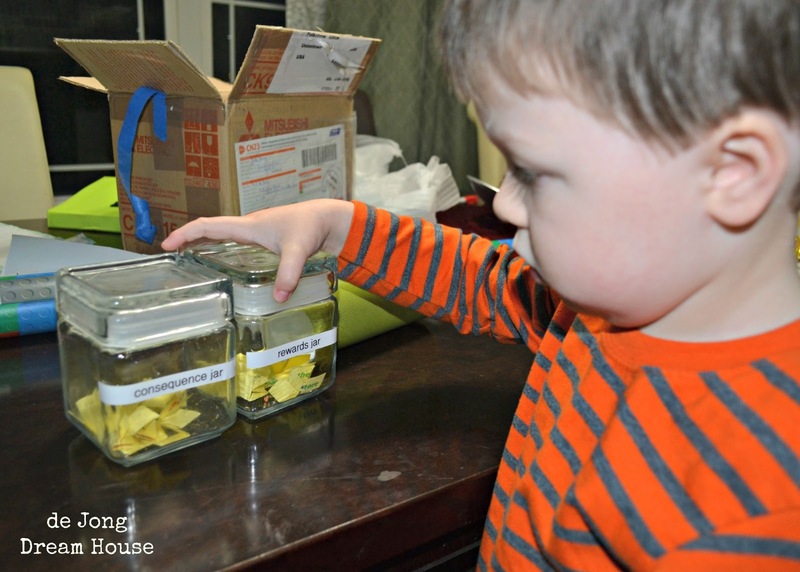 The hardest part was coming up with creative rewards and consequences that would be meaningful for our son. We purposely avoided chores as consequences because we are teaching him that helping around the house is just part of being in a family. We don't want him to see chores as punishment. D loves trains, cars, space, books, technology, and time with mommy and daddy, so our list corresponds to these things. The first consequence I wrote down was "grace." As a family of faith, I wanted to take advantage of this opportunity to teach D that grace is getting something better than we deserve. The first time D pulled the "grace" card, we had a great conversation about God's grace and it really hit home for him. It stuck with hi when we were on vacation and we didn't have the jars with us. He made a bad choice so I said, "I think you'll need a consequence for that." He got really quiet for a moment, and then he said, "I choose grace!" As a general rule, we aren't rewarding with food, although we do have a few food-related rewards below. Rewards are given when he does something above our expectation, without asking to be rewarded for it. For example, if we are at the store, and without prompting, he holds a door open for a mommy with a young child. go to the toy store (this does not mean getting something, but just to look. He has to save up for toys. He enjoys looking a toys and writing down what they cost so he can save up). pick something from the save box (we have a box of toys, books, and small items that we can use for gifts in pinch, but also that D would like. They are things I pick up on sale for no particular occasion). Another general rule we followed is that a consequence only lasts a day. A day is a long time to a preschooler. We are teaching him that God's mercies are new every morning, and so are mommy and daddy's. 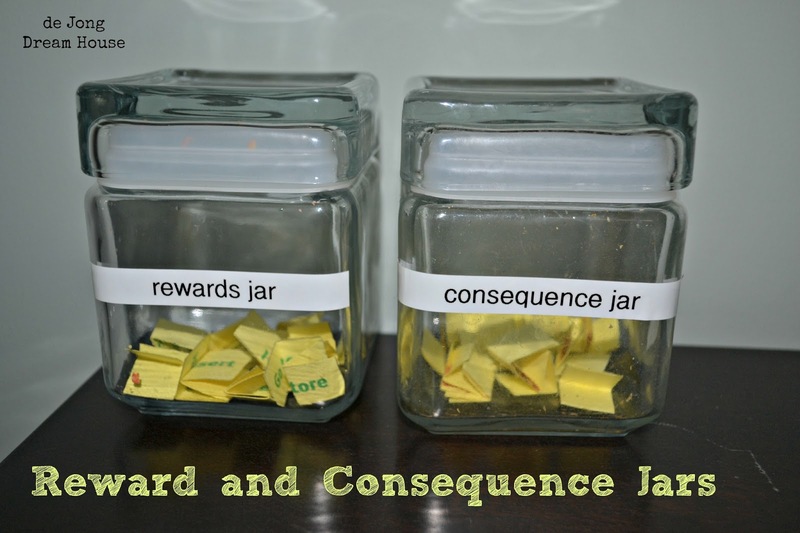 I cut up the strips, folded them tightly, and put them in the corresponding jars, which I labeled "rewards" and "consequence." Our smart boy started noticing when me and his daddy made good and bad choices because he wanted to get peeks at what the other strips said! He also started doing good things without being asked, but then said, "Do I get a reward now?" 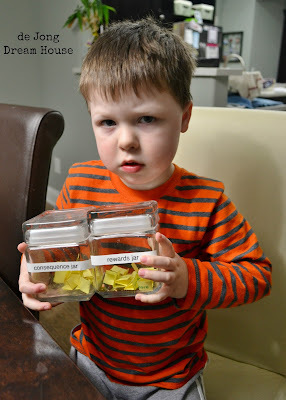 It only took a time or two of us reminding him that he doesn't get a reward if he asks for one, so now he's much sweeter about being helpful. For the most part, the jars are working out well. He does have a bit of the same stubborn streak that Niels and I both had, so sometimes he just chooses a consequence when he really wants to do something we've asked him not to do. That's clearly frustrating to us, but for the most part, he is understanding the correlation between his choices and the results of them, and his behavior has improved. Thanks, Sara! It's been a game changer for us! I'm wondering if it's too early to try this with my loving but very stubborn 3 year old. I'm a little desperate for something that might help with this listening problem we are having. Brenna, we rolled this out to our son just before he turned 3. If I would have thought of it earlier, I would have started using it when he was about 3.5. Good luck! Jen, I remember you telling me about these, and the story about D's "grace" comment was so touching. I'm pinning this for the future when we have little ones of our own to extend grace to...and to ask for grace from! Thanks for the pin. You'll be a great mommy...whenever that is! This is great! I'm visiting you today from Keeping It Simple. I co-host a Linky Party Tuesday (open thru Sat) and I'd love for you to link up! I hope you get a chance to stop by, link up and leave a comment, too! This is a really great idea! My son is not yet 2, so still too young for this, but I am a huge fan of this type of reinforcement, and I think this will be good when he gets older. Thanks for sharing! Thanks! When D was younger, a short time out or redirection worked just fine. Then came 3.5 and the discovery of his own free will! visiting from dream to reality. This is awesome. I love it. I love the grace card. What a great way to teach your children to grow up in Faith and Love. Thank you so much for stopping by! It only took one time before he got the idea. Today he told me that "grace is a consequence that's really like the best reward." 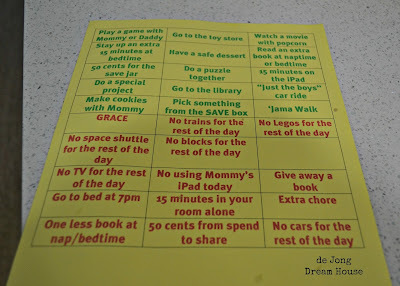 LOVE this, pinning to do this week! Stopping by from Pin Me. Thanks so much for stopping by, and pinning, and following! What a clever idea! 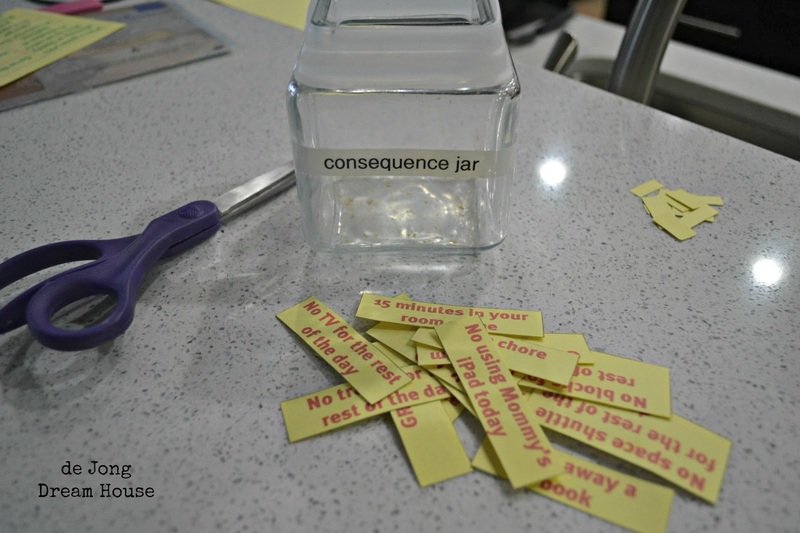 I'm trying to think of some consequences for a teen and pre-teen. the rewards part is a breeze. Thanks for sharing at Fluster's Creative Muster Party. If I picture my son in ten years, I can imagine that taking away technology would be an effective consequence! Let me know what you come up with!